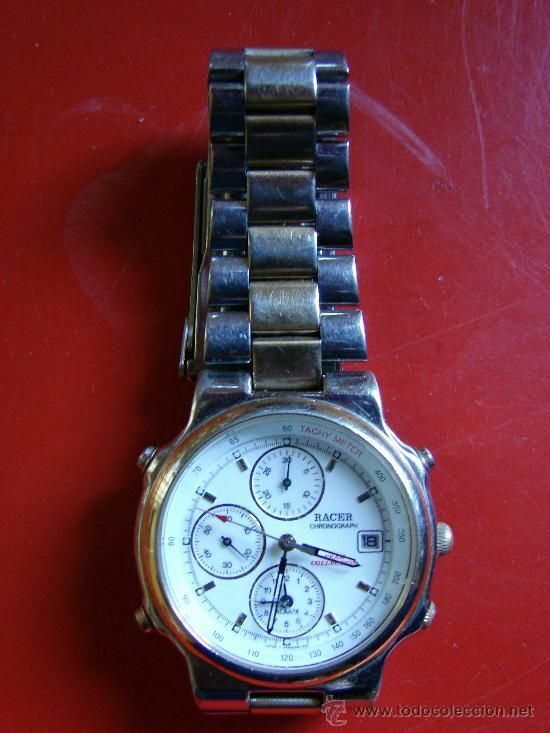 It's been a good while since I'd stumbled across any previously unknown re-branded Seiko 7A38's. It was getting to the point where I thought there might not actually be any more waiting to be re-discovered. But my enthusiasm for online detective work never wanes. The first thing I'd honed in on was the RACER logo - a very similar typeface to that used on ORIENT J39's, with exaggerated serifs. you'll sometimes find (re-branded) 7A38's by the same manufacturer. So I started googling, like a man possessed, all over again. Lawrence and I have traded an inordinate number of PM's over the last couple of weeks, with a fair smattering of content. Yup - a YOU TRY branded N945 by ORIENT ! Completely irrelevant, but it opens the possibiliy of further re-branded Orients. In the meantime, Lawrence had started to take the 'Rare 7T32' thread off topic at the top of page two, by posting more about N945's. 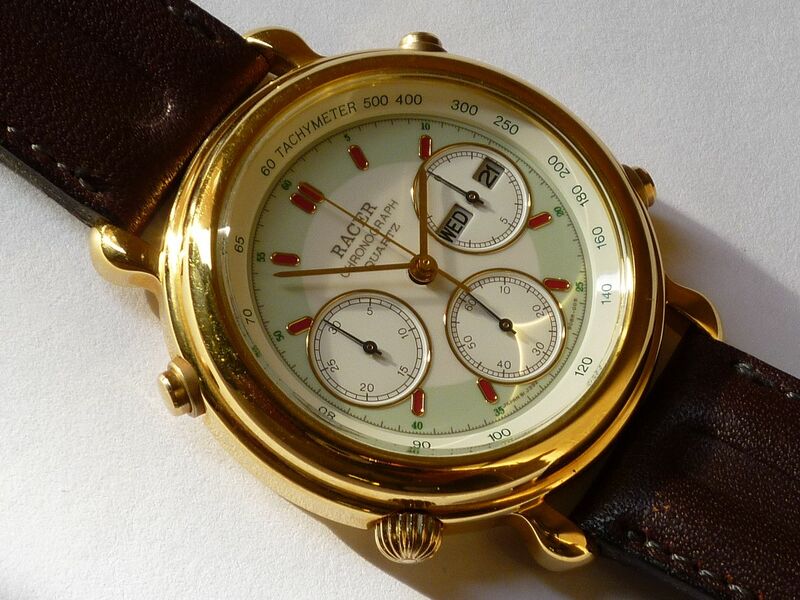 Now found a Radiant 7T32, not sure how they relate to Seiko other than being a Spanish brand like Racer. followed by: ...and another, plus a Racer (pronounced "Ra-Sir"). Spain is definitely the place to find these. While Lawrence continued to bombard me with an amazing array of distracting off-topic links, I'd been searching long and hard. 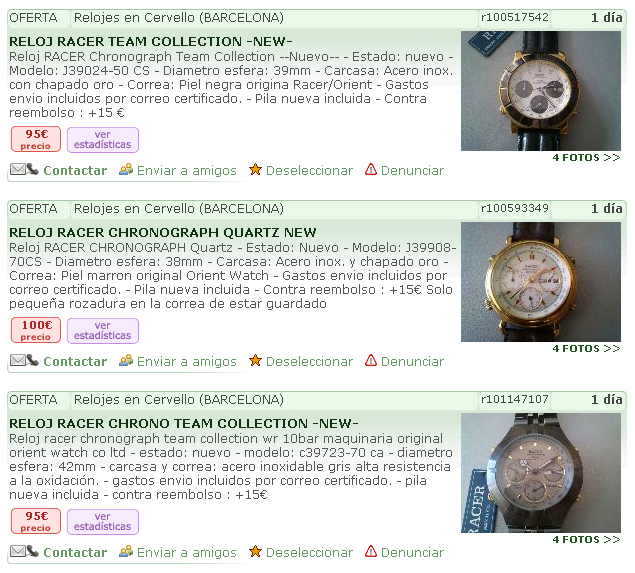 But finding out anything about the current state of the brand (now sadly defunct) meant resorting to searching Spanish watch forums. 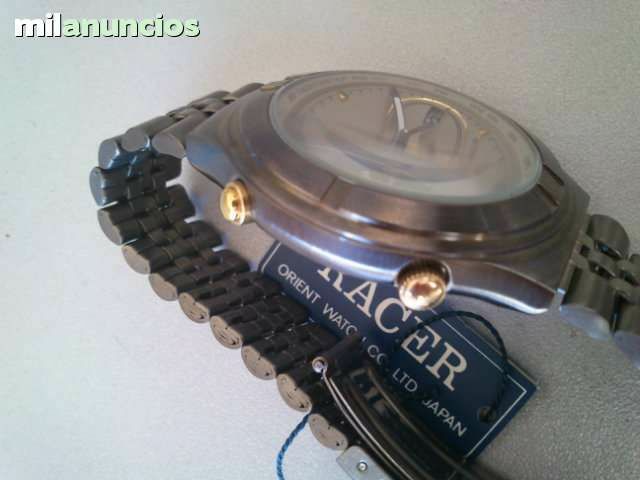 RACER is the brand under which ORIENT distributes quartz models in Spain. Though perhaps that should now be past tense. So, after that lengthy preamble , how did I finally manage to stumble across my first Racer J39 ? With apologies to our Spanish readers, for another Python-esque link, but .... Nobody expects the Spanish Inquisition ! and found nothing, other than a lot of irrelevant crap, which included 'Racer' in the title or description. See the results for yourself. Prompted by Lawrence's Racer 7T32 find, I tried www.todocoleccion.net - which appears to be a free Spanish classified advert site. A better selection of results, but still no sign of anything resembling a Racer '7A38'. 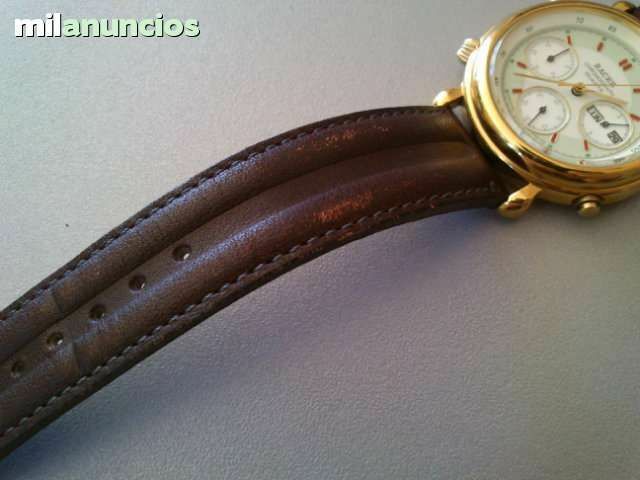 Then I remembered www.segundamano.es - the Spanish equivalent of LeBonCoin.fr - another free classifieds / alternative to eBay. Lots more results - 7 pages of Racer watches to wade through, with annoyingly small thumbnails, but still not what I was looking for. That takes me back to just over a week ago, when I'd been checking the forum's control panel / statistics package, and noticed a couple of incoming google searches on Orient J39908-70. Both of the visitors arrived at the thread I've have expected them to. However, if you google Orient J39908-70 today, our forum's various threads aren't the top result returned, but a Turkish blog page. (The blog entry includes 8 photos, but as some of the images are very similar, I've only bothered uploading half of them). FREE SHIPPING: AIR MAIL WORLD WIDE includes Tracking / Insurance. The watch runs and keeps time. 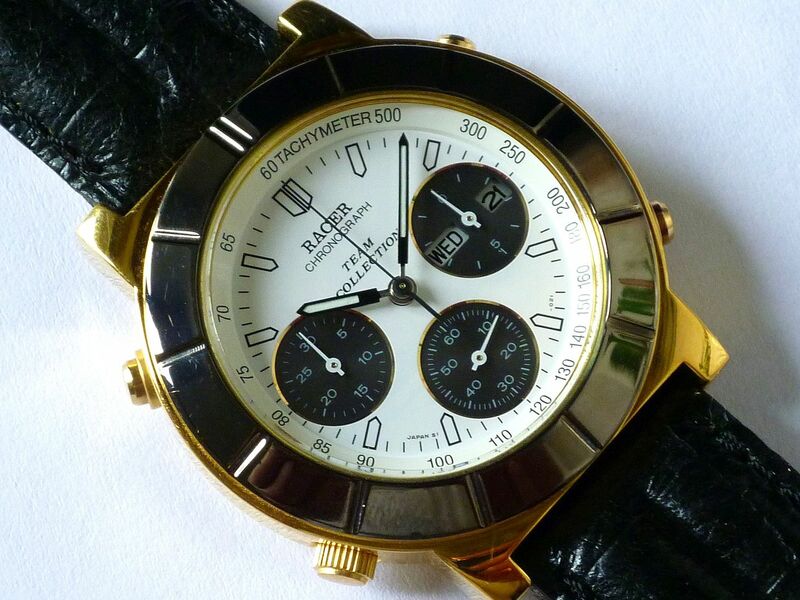 But the dial, similar to my 'beater's, is branded RACER; has gold subdials, surrounded by a black Tachymeter ring with gold lettering. 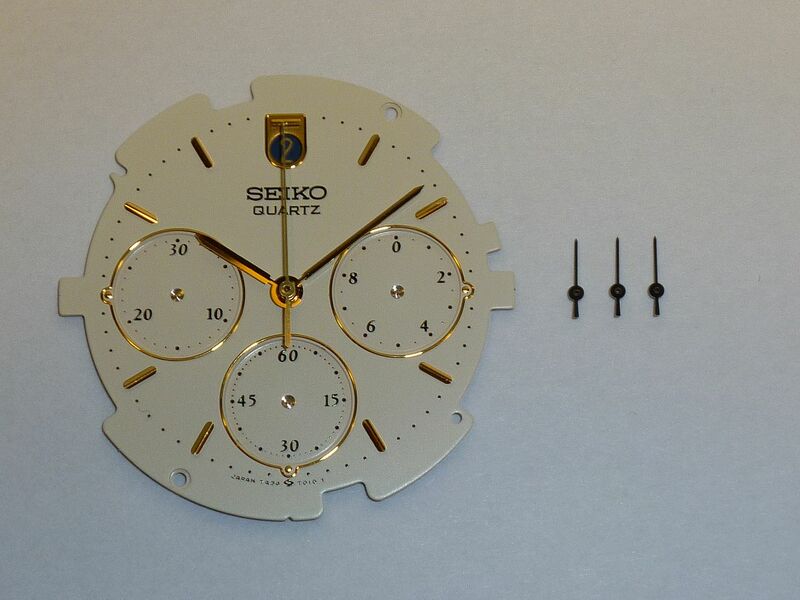 The hands, both the main set and sub-dials, appear to be from Seiko's 'parts bin', as used on the 7A38-702A / H and other models. 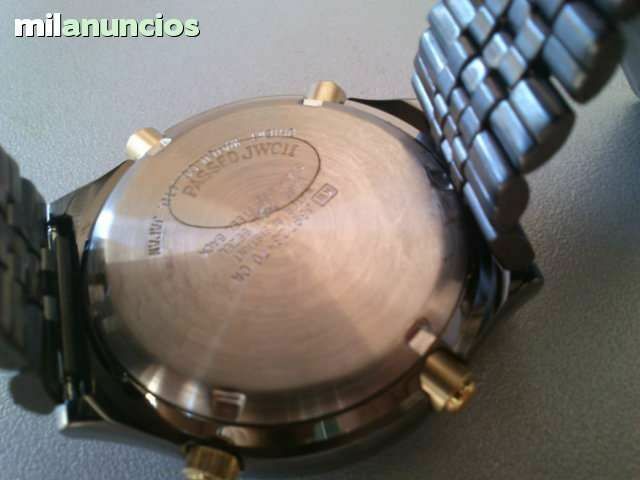 Yes, I'd noticed that the hour and minute hands' lume was suffering from fungus. That's the reason I wasn't too worried about them. 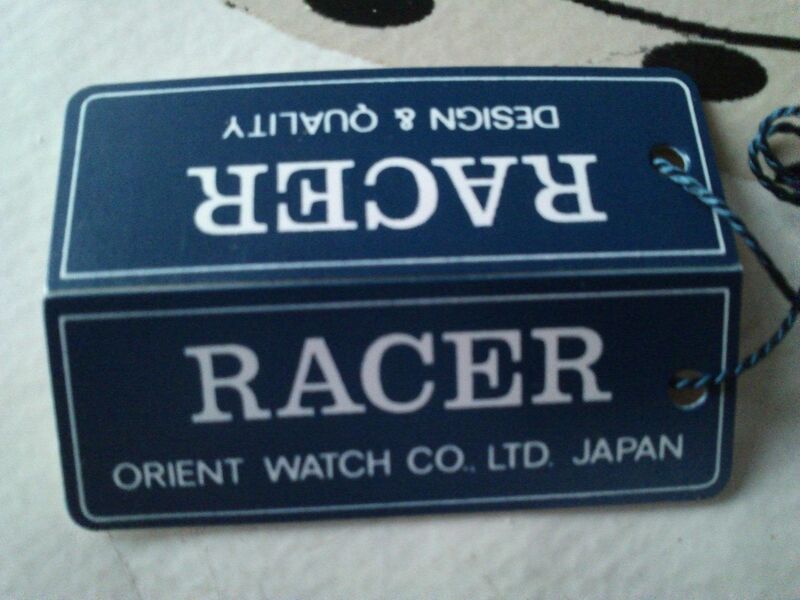 including a link to my first (re)discovery of a Racer branded Orient J39, which at the time of writing, is still in transit from Turkey. Further related banter followed. Lawrence must have gone on googling bender, because on Friday he dropped his first bombshell. 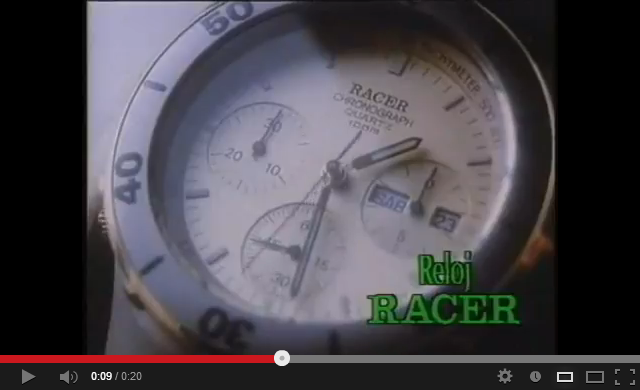 Prepare to have your mind blown... Racer 7A38 in a TV advert. Indeed, very briefly between 0:08 and 0:09 of the 20 second advert (blink and you'll miss it), there it was. 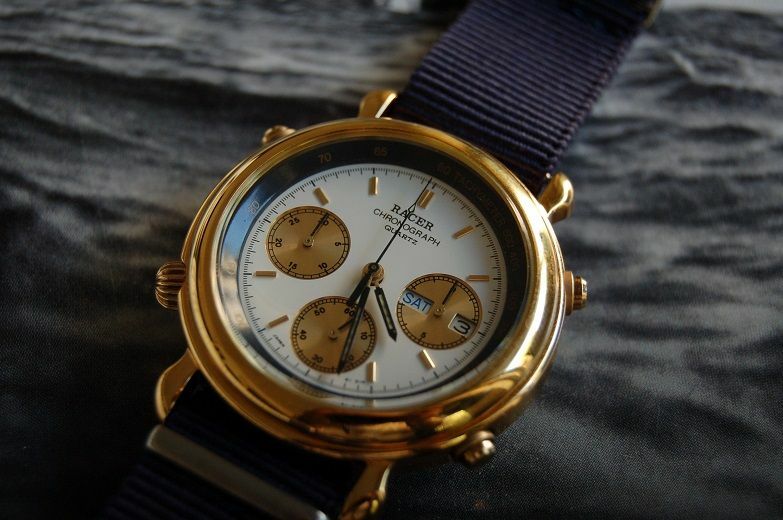 But then I noticed it had a gold-plated bezel rim, pushers and crown, which would make it a J39001-70. Slightly odd combination. 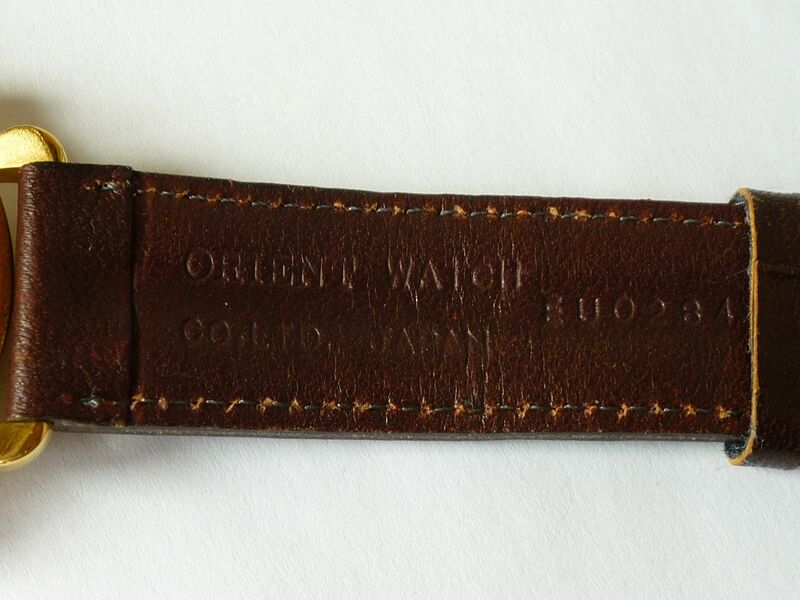 Thinking about it, there's a sizeable gap in the model number sequence (of the Orient J39 variants of this watch case that I've seen). So assuming this has a slightly different case-back number, it could possibly be anything from a J39201-70 through to a J39501-70. It's a small Excel 'knowledge database' I've built up from sightings of Orient J39's (mostly in my own collection), with some data from www.boley.de. I've posted it in a couple of other threads - last updated in December 2012, prior to seeing Steve's Puma Y19904-50. You can probably already guess my line of thought. Anorak ? Moi ? 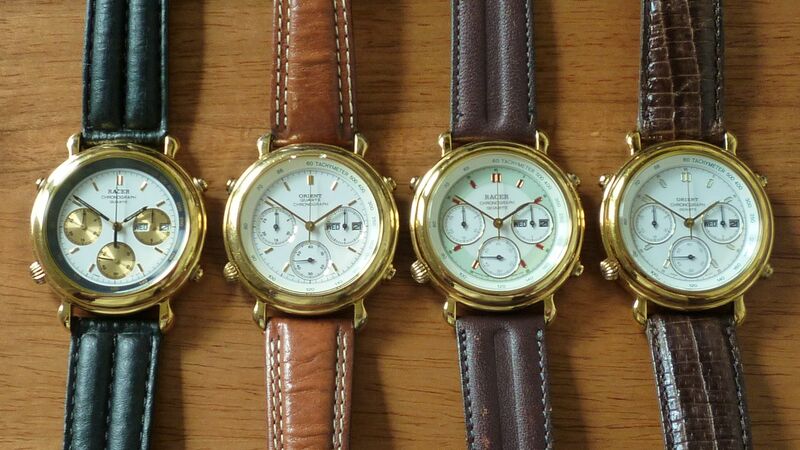 If there had existed other variants of Racer J39 (besides the two so far), would they all have used the same watch cases / case-back model numbers as their Orient J39 equivalents, or might they help fill some of the gaps in the numbering sequences in my table ? The answer wasn't very long in coming. Oh Christ, I've only found the motherload ! You should sit down before you open these ! Appears to be a Spanish classified site. I clicked on each of the links in turn went downstairs; made myself a cup of coffee and dragged hard on a cigarette. Before you go clicking on the links, they don't work any more. 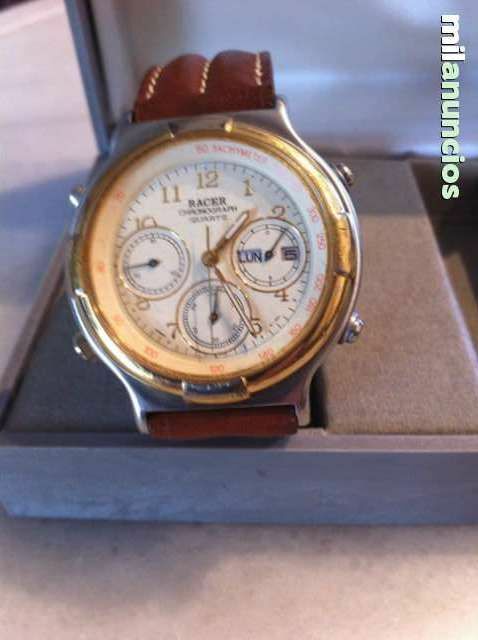 The watches are sold and the adverts have since been deleted. I'm still gradually getting my head around how milanuncios.com works, but it's different from todocoleccion.net and segundomano.es. All 3 were NOS with tags: one was yet another variation of J39908-70; the other two previously unseen: a J39024-50 and a J39723-70. Although all three adverts show as one day old in my summary, I suspect these were recent re-listings. By the time they were removed, those adverts had received between 400 and 600 views apiece. Needless to say this fact instilled a certain urgency (read panic) in me. Noting that they were all offered by the same seller 'Albert' who gave his location as (Barcelona), I rapidly blasted off an urgent email to Julio (forum member Jota) who lives in Barcelona, asking for his assistance in buying them. As it transpires, Barcelona (in brackets) on www.milanuncios.com means the Barcelona environs - not just the city. The seller actually lived in Cervelló, some 20 Kms outside. So Julio did indeed 'go the extra mile', and then some, in meeting the seller halfway to buy them for me. Muchas Gracias, Amigo. 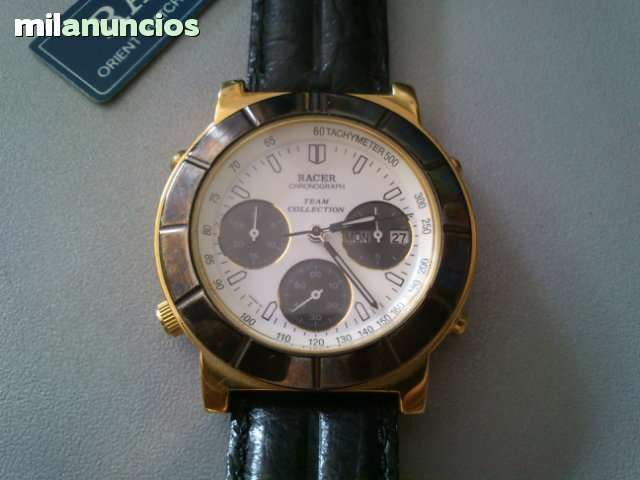 As today is a public holiday in Spain, Julio won't actually be posting the watches till tomorrow, so I'm unlikely to have them much before the end of next week. Not wanting to 'count my chickens before they're hatched', I thought I'd make a start writing up the topic anyway. 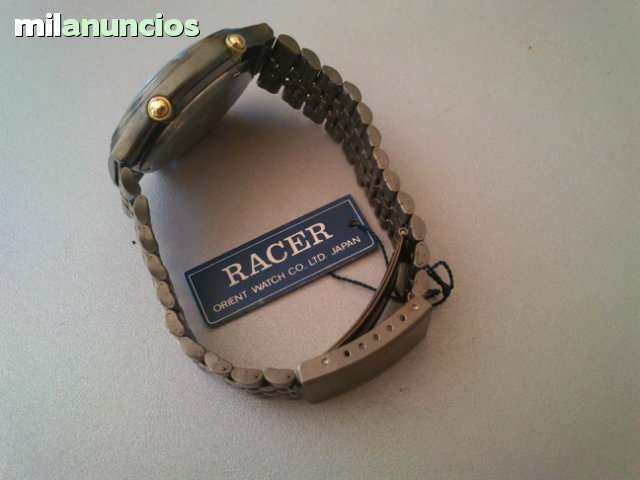 Racer 7A38's seem to be parts-bin Orient's, maybe a way of quietly shifting unsold stock? Funny, even your incoming dressy version has sports-style hands. Factory frankens. That was before he'd found these three. He wasn't far out in his assessment ! So here are the photos I'd saved from the three adverts (not quite in the same order) and what I've gleaned, so far, by studying them. 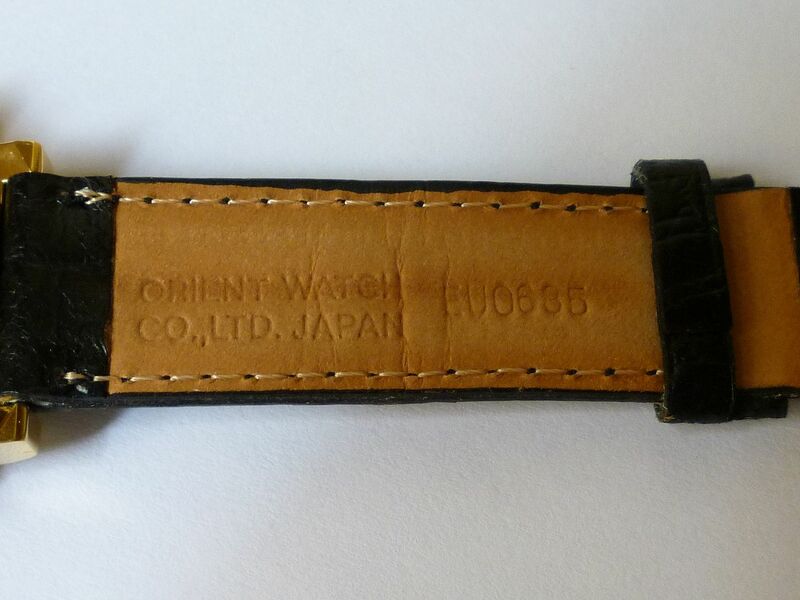 What can I say, but a 4th version of the same Orient watch case. I couldn't resist it, nevertheless. 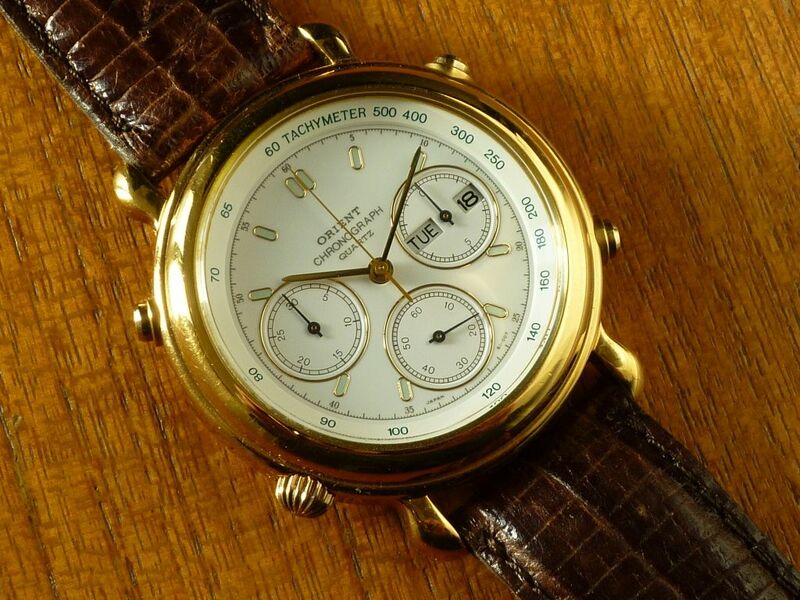 The dial is an identical layout to the NOS Orient J39908-70 which I bought from that Italian eBay seller, last December, with the same curious oval gold outlined batons. It also has a slightly odd-looking light green ring around the dial and, even more curious, insides of the batons are red. This had already prompted me to dig out my Orient version, and take a closer look. What I'd previously incorrectly assumed to be lume in those batons turns out to be the same light green paint. 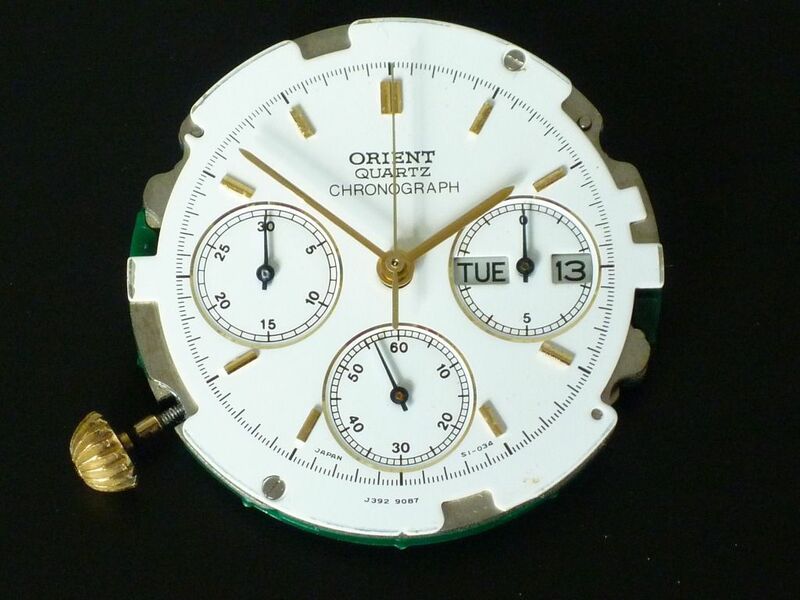 The reason for the dark green lettering on the Tachymeter scale (as opposed to black) on my previous two Orient J39's becomes more apparent. It'll make for an interesting side-by-side comparison photo, if nothing else. Goes without saying, I really like the Panda dial. 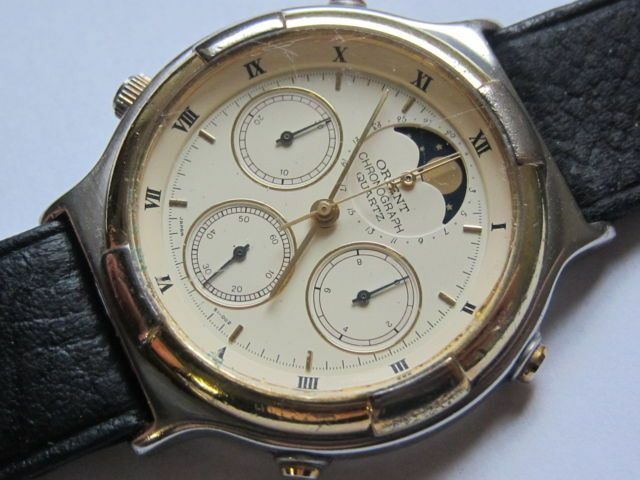 Note it also has the 'Team Collection' logo, seen on the 7T32 which Lawrence posted. 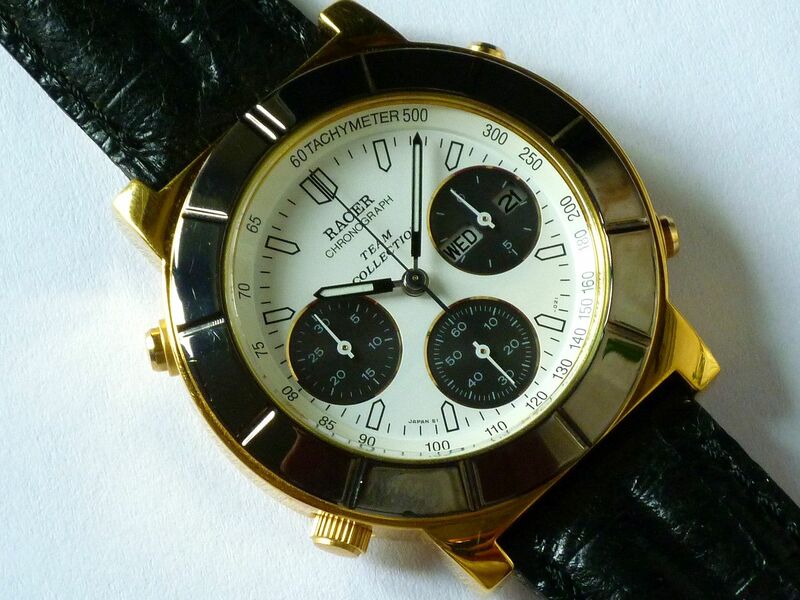 But why, on a gold-tone watch have stainless + black painted hands ? Simple, hand written, inside - not quite what I'd expected. The price shown of 31,995 Spanish Pesetas equates to around 192 Euros. 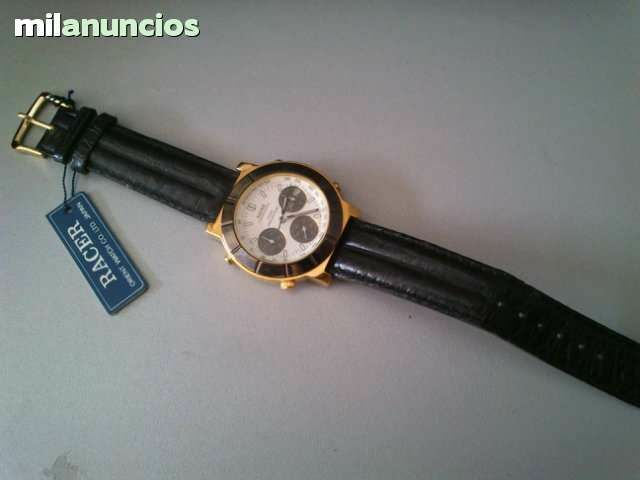 It's currently still there: http://www.milanuncios.com/relojes/reloj-de-caballero-racer-101730434.htm (Sold on 10th September). Earlier this evening, I made a somewhat belated correction to the most recent post I'd written in the Orient J38 thread in this section. If you hadn't recognized it, this hereto unidentified Racer J39 uses the same two-tone watch case as two similar Orient J38 models. If the information I've posted is now correct, they were a J38001-70 and a J38911-70. Having already fallen foul of some apparent inconsistencies in Orient's case-back numbering system, I'm not even going to begin trying to guess the Racer J39 model number. They are exquisite. I'm amazed at the great trinkets that you manage to unearth. Carry-on Sir! 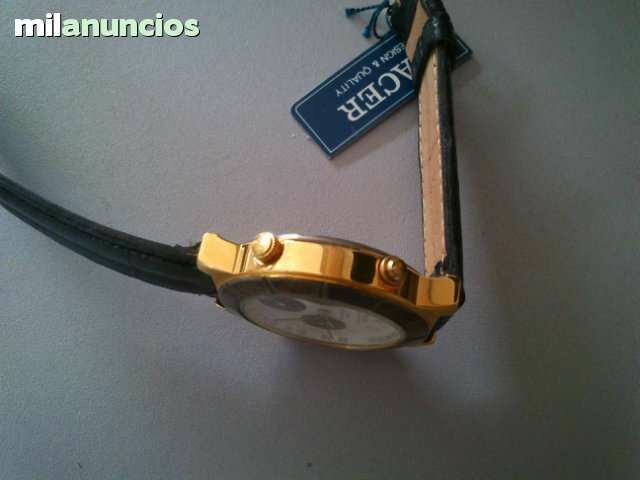 Now I see the watchband you are trying to replicate. Back to my plebeian 7A's.......Paul. Hadn't noticed the Team Collection link with the original 7T32... A possible tie-in with the '92 Olympics? Possibly, Lawrence. Perhaps that might explain why most of the Racer J39's we've seen so far have been in the Barcelona area. I suspect it's just a bit more branding: Racer + Team. 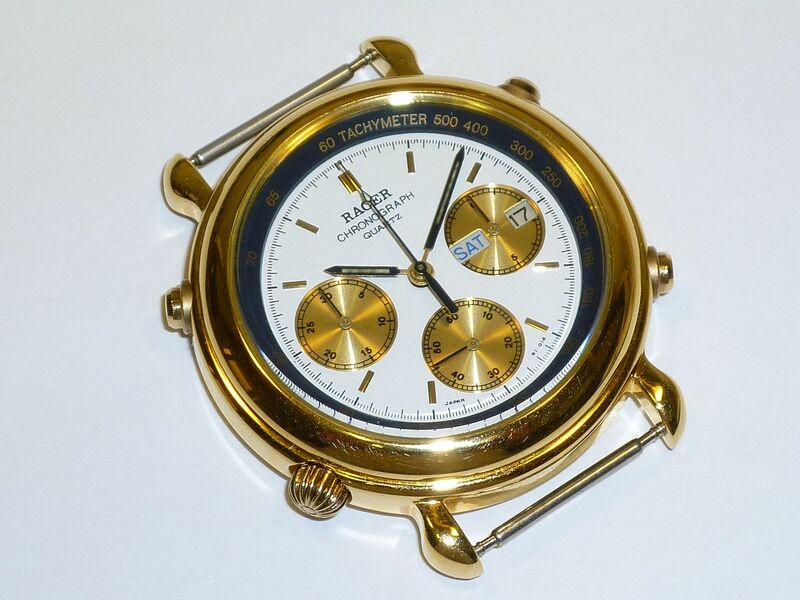 What will prove interesting, is if it turns out that these 'Team Collection' logo'd case models were unique to Racer - effectively limited editions, and not just re-dials of existing Orient models like the J39908-70 was. Those Mercedes hands on the Racer J39723-70 aren't entirely unique for a (non) Seiko 7A38 - the Yema N8 Flygraf had them too. The postman delivered the first of my incoming veritable 'Spanish Armada' of Racer J39 Orients this morning. At first I was pleased. Here's the wrist shot I posted in the WRUW thread this morning, with it still fitted on that horrible cheap NATO strap (as supplied). The seller also included a free gift in the package: another leather strap, but only 18mm wide - not the correct 19mm needed to fit the lug width properly and a spare Renata #394 battery. He was obviously trying to sweeten the deal. He'll have to try a lot harder. My first concern was when I checked the watch's functionality. I carefully flicked over the Day / Date wheels, using the quickset, and noticed that the second language was German. 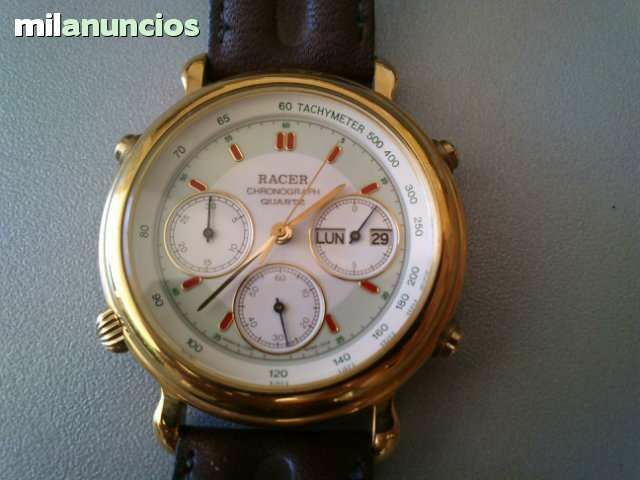 Fine perhaps on an Orient J39, but this was a Racer J39 for the Spanish market. Yes, I'd noticed that the hour and minute hands' lume was suffering from fungus. At least the case and crystal were in very nice condition. 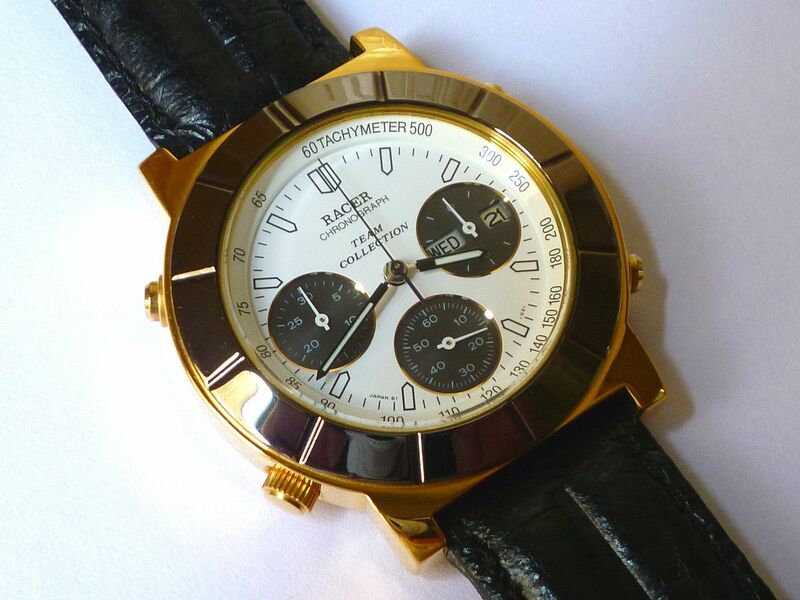 The gold on black Tachymeter isn't easy to read without lighting it artificially. The case-back stampings on this Racer J39 are exactly the same as as on the Orient version, which I already knew from his photos. 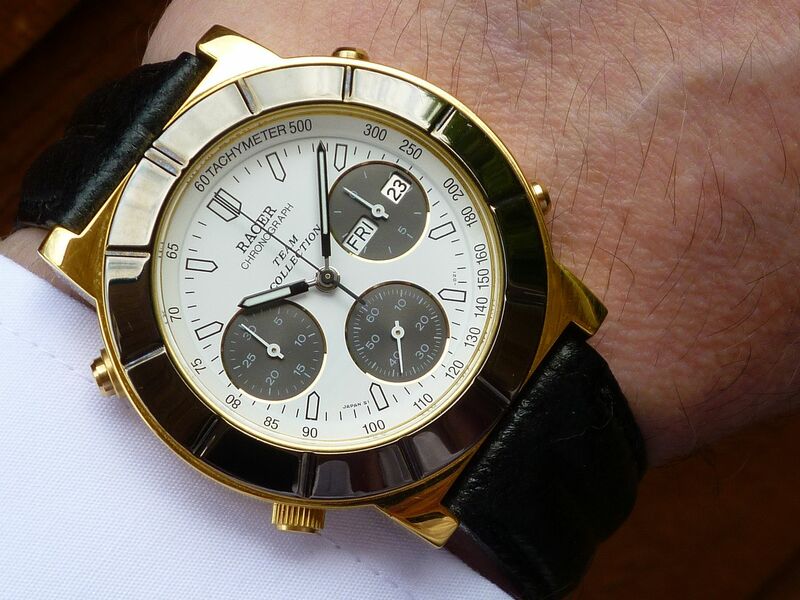 If you look again at my wrist shot, you'll see a couple of bits of floating detritus. 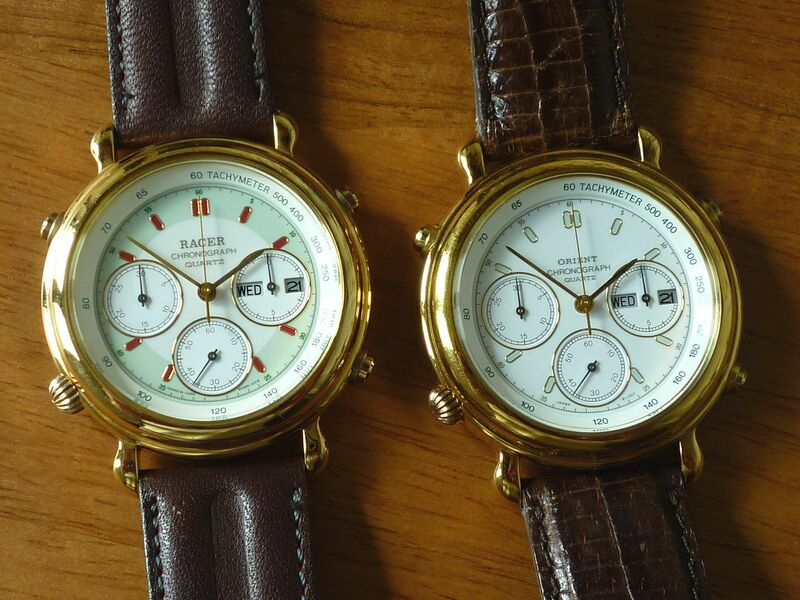 One on the dial, near the 1 o'clock baton, and another on the Tachymeter ring between 100 and 120. A pretty sure sign that the watch had been taken apart and possibly messed about with. 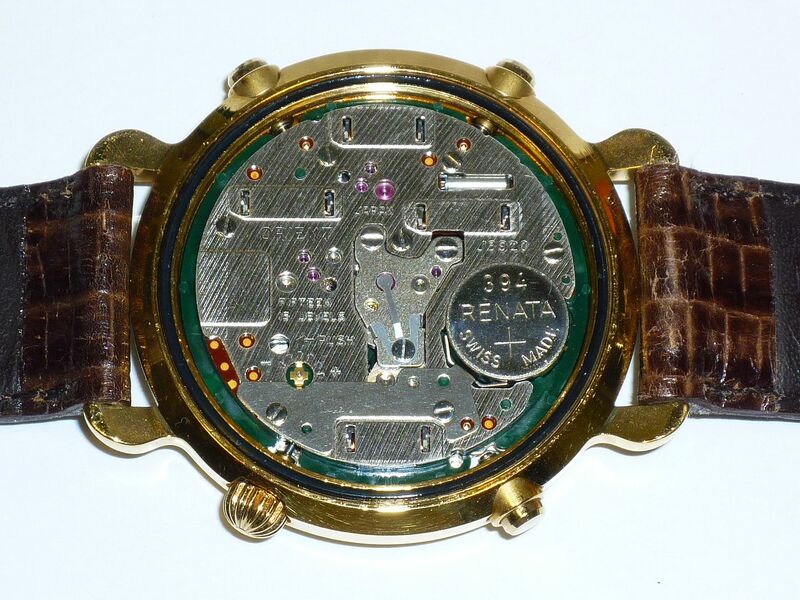 A Seiko 7A38(A) movement with a rusty back-plate !! 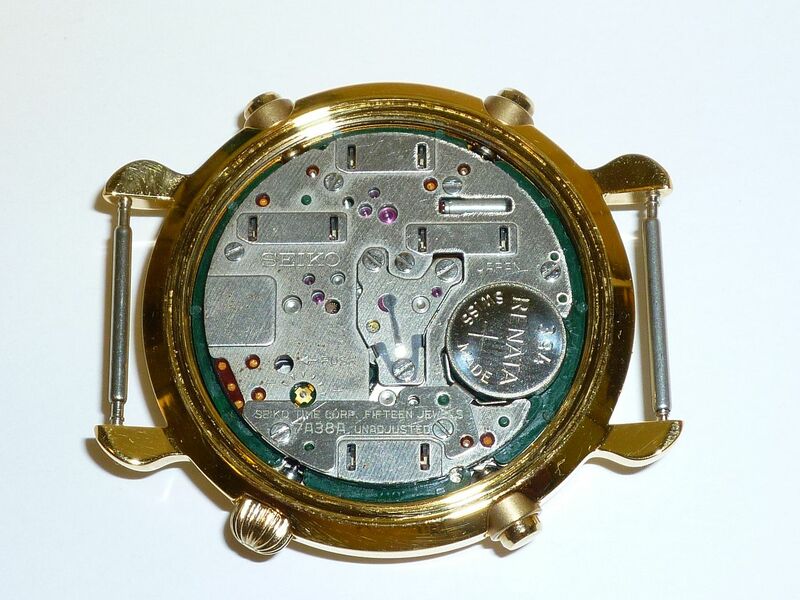 So it's now quite clear that the seller has replaced the movement and all 6 hands, from a donor Seiko 7A38-702A/H, or some such. Needless to say, he will be hearing from me in due course ! "Our watches are all serviced by some of the best watchmakers in Europe..."
Well perhaps that's how they bought it... No doubt they will claim that either way. Still a looker despite the murky past. Anyway, I've blasted off a strongly worded email to the seller, expressing my anger and disgust at being duped. Let's see. indeed that whole paragraph is copied verbatim from here: http://tempussuisse.com/about/ I'm sure they'll be pleased about that (not). In the meantime, curiosity got the better of me, so I decided to see how much more of a Seiko / Racer Franken this might be. 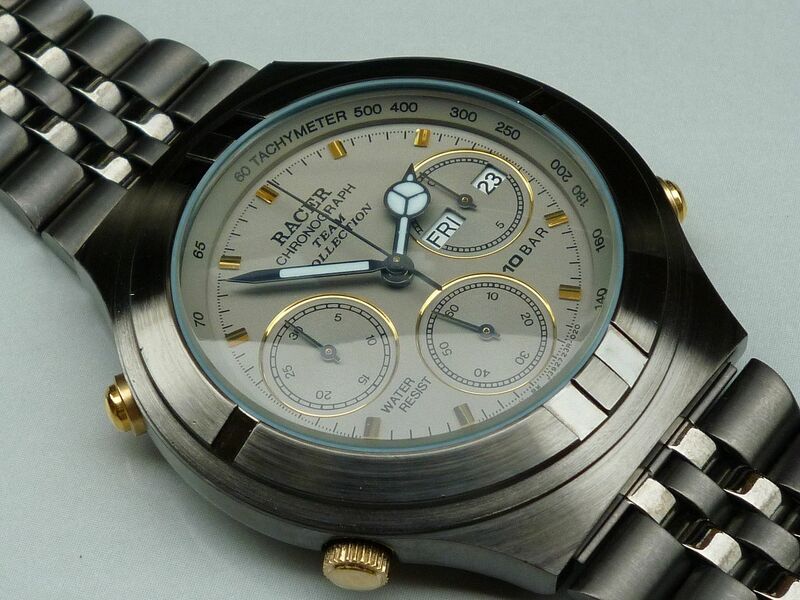 My next concern being the dial fitted. 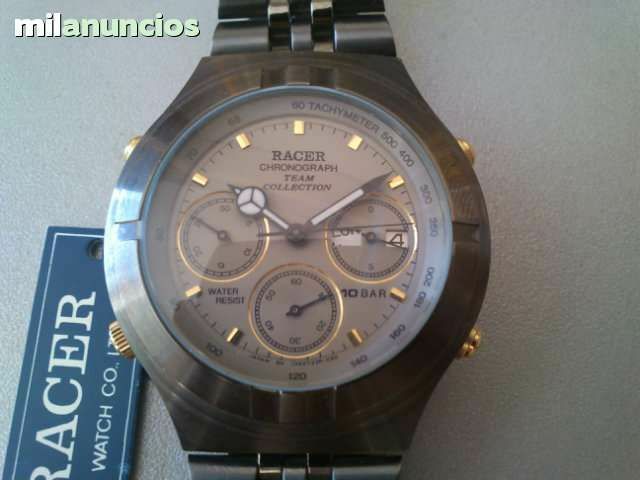 Athough it was branded Racer, was it actually the correct dial for this (Orient) watch case ? 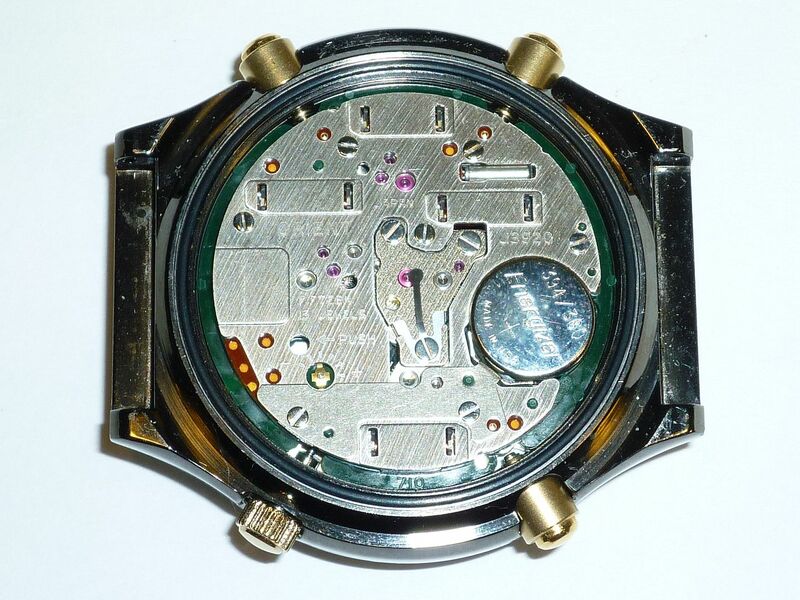 Here's the dial / movement from my first (battery acid damaged) Orient J39908-70 (photo taken during its rebuild in September 2011). Note the dial numbering SI-034 and (usually hidden underneath the Tachymeter ring) J392 9087, which ties in nicely with J39908-70. 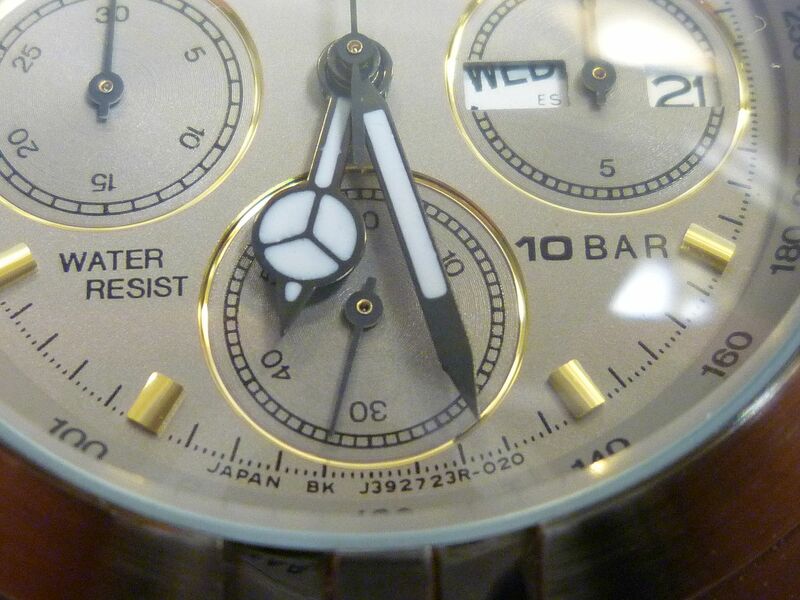 The dial numbering is very similar: SI 014 and (normally hidden under the Tachymeter ring) J392 908R. Near enough in my book. Notice the missing top dial foot screw. 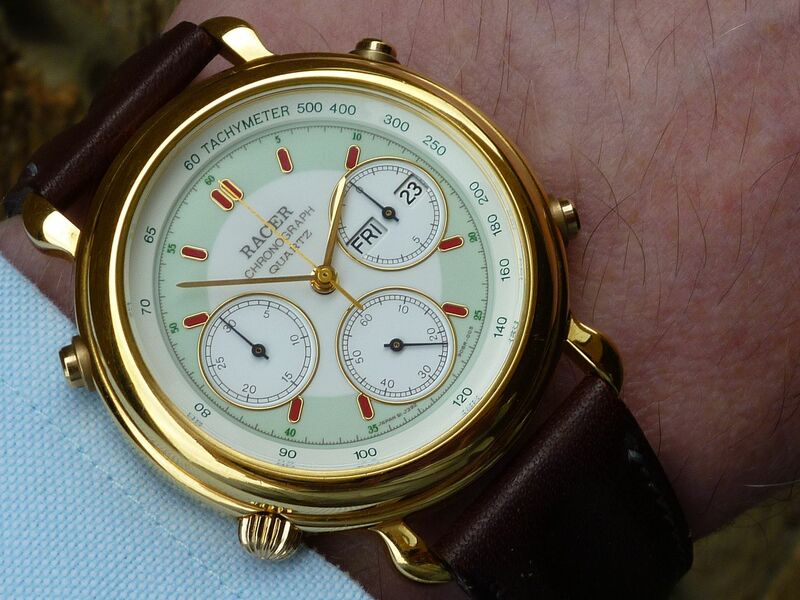 What also p!sses me off is that this Racer dial is almost pristine. No sign of tarnishing of the gold-plated batons, like my Orient above. Yet the gold plated bosses of the very second-hand Seiko hands this person has fitted, as part of his botch-up, are clearly tarnished. So whereas, before its arrival, my priority had been to find a suitable 19mm strap, now I'm looking for a set of correct original hands. No, I don't plan on returning it, Lawrence. 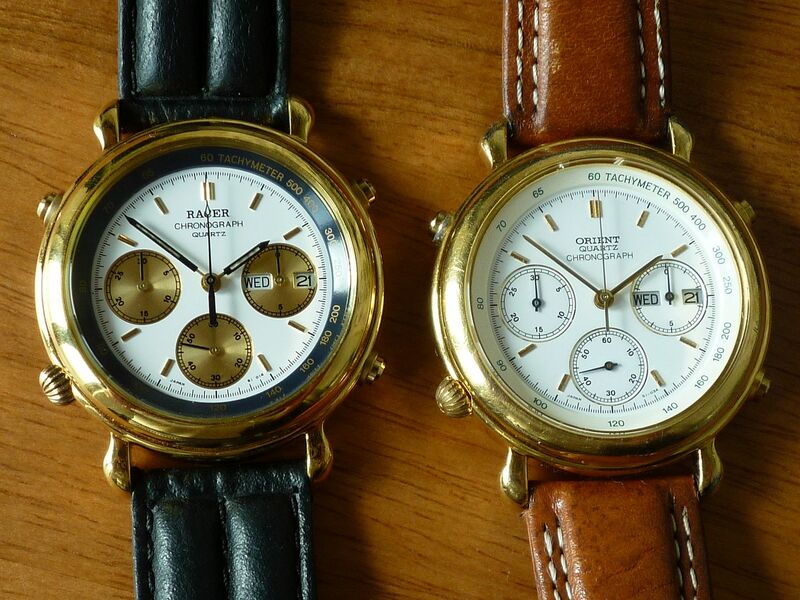 The case, case-back, crystal and dial are all in nice, almost pristine condition, and I doubt I'll easily find another used example with case parts as good as these. 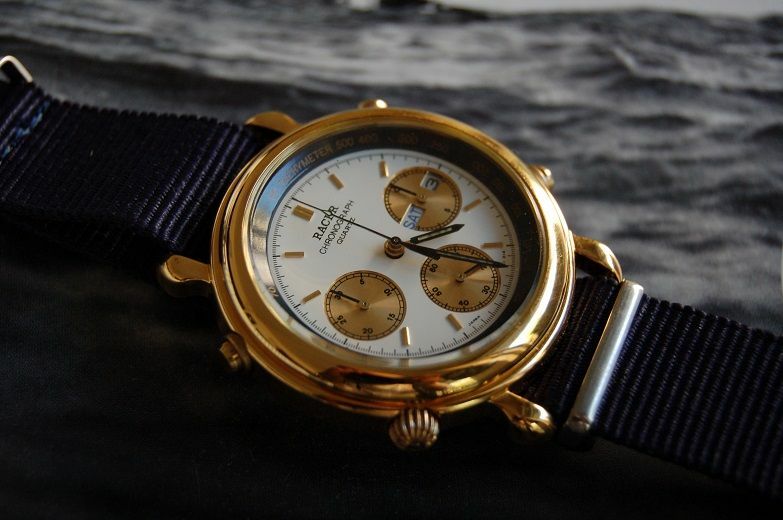 If I do eventually find another of this exact same Racer J39908-70 model, the case will go to improving my first Orient J39908-70. What I'm leaning towards, at the moment, is either hoping to get all the missing original Racer J39 parts back from the seller, to make it good - or failing that a sizeable partial refund on the purchase price. I've just put it back together. Cleaned up those two bits of floating debris with Rodico (the black bit near the 1 o'clock baton, visible in my wrist shot, was actually on the underside of the crystal). Before I dropped the movement back into the case, I thought I'd replace that missing dial foot screw - I've got a few spare in my bits box, from scrapped movements. Wrong !! It wouldn't thread in. Transpires the reason they hadn't replaced it themselves, is because the remains of an old screw are broken off in the movement base-plate ! So as I was going to pull the hands anyway (once I've sourced the correct, or similar appearing replacements), it looks like I'll now have to fit the dial to another movement - looking though my bits boxes for one with a Spanish day wheel. Another thing which concerned me was the amount of advance (almost two divisions on the rotary step switch, but halfway between two marks) they'd given it. I've re-set it back to zero and set time by the Atomic clock. Let's see how accurate it keeps, and whether the day-date changes properly overnight. Well after lengthy heated correspondence with Tickdong's proprietor, Mahmut Kahriman, I managed to secure my secondary objective - viz. a sizeable partial refund against the purchase price. However he failed spectacularly to provide any kind of explanation as to why the watch had been messed about with or what had become of the original hands. They were what I wanted more than any refund. 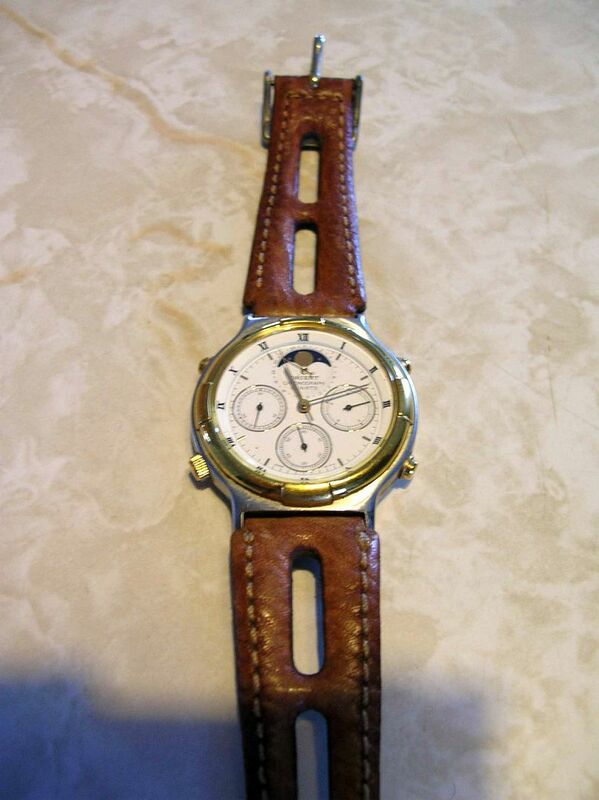 I've been looking at various options, but nothing used on Seiko 7A38's is really close enough. Although they may well be Seiko parts, those hands are unique to Racer and Orient J39's. The sub-dial hands (in different colours) are also used on Puma Y19's. Best match I've found so far are the main set from a 7A34-7019 sample case dial and sub-dial hands I'd removed from a scrapped 7A38-727B. The 7A34 hands have a step before the boss, which the Racer / Orient hands don't have, but worse, the Racer / Orient J39 hour hand is proportionally much longer. The sub-dial hands are close-ish, though they don't taper as sharply, but their tails will need shortening. The other good news, if you can call it that, is that the grotty-looking movement kept accurate time, to the second, through the night. The Day / Date changed over automatically too. However, the Date started changing over well before 11:00pm and was complete by Midnight. I didn't sit up to watch the Day finish it's changeover, but I suspect, like the Date it was 30 minutes in advance of 'the norm'. 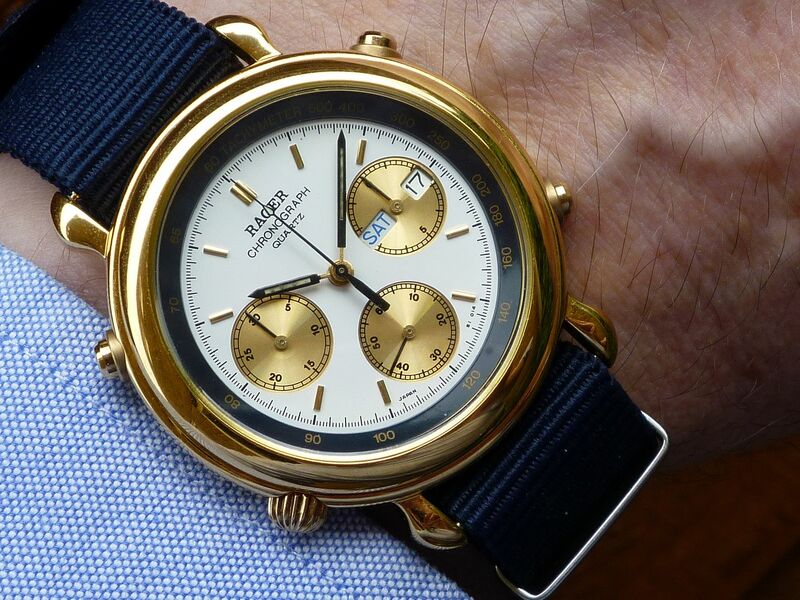 I haven't done anything else since, with the Tickdong Racer J39908-70 - either in regard to the non-original hands fitted, or sourcing a suitable strap - let alone the annoying fact it was fitted with a Seiko 7A38 movement. 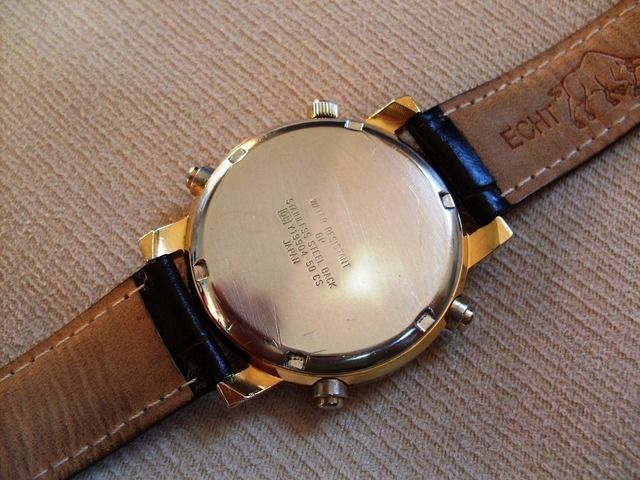 Instead, I turned my attention, somwhat belatedy to its sister watch - my original battery-acid-damaged Orient J39908-70. See: The 'Round-Tuit' thread I wrote in the Workshop section. The reason I hadn't tinkered further with the Tickdong J39 is that I've had a few other distractions this week - more incoming goodies. I collected Julio's package with the 3 ex-milanuncios.com NOS Racer J39's from the Royal Mail sorting office on Tuesday afternoon. They turned out to be everything I'd hoped they'd be, so I'm pretty pleased with what was something of an impulse (panic) purchase. I took lots of photos of all three of them on Wednesday - probably in too much of a rush, so I wasn't entirely happy with the results. I've discarded the bulk of them and will probably replace a few of those that I do upload, later today, with hopefully better shots. This lovely little watch was just what I'd expected. 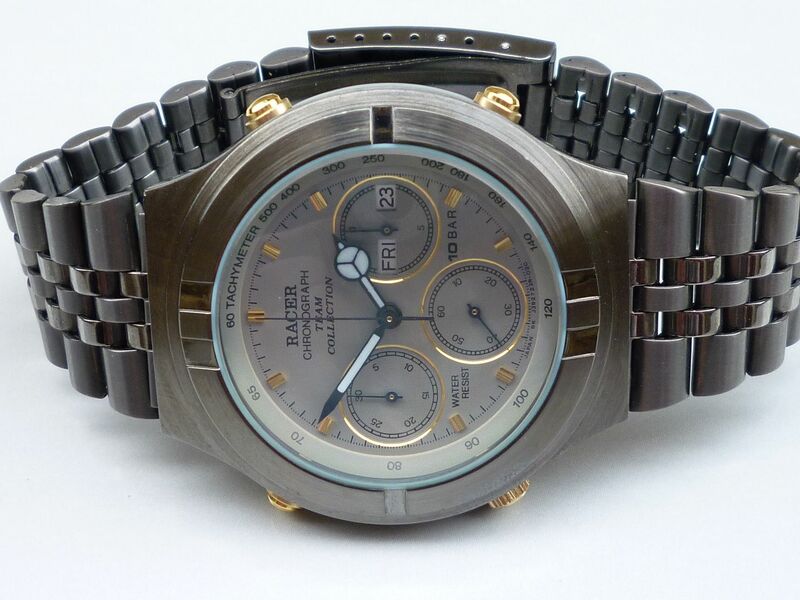 It's effectively exactly the same watch as the NOS Orient J39908-70 I already owned. With the two of them side-by-side, the dark green printed Tachymeter scale used on both these watches begins to make more sense. Where it's more strikingly different is the dial batons. When I examined my NOS Orient J39908-70 last year, I incorrectly assumed that the green infill of the oblong gold-rimmed batons was lume. Never tested it of course. Unlike other watch enthusiasts, I'm indifferent to lume - even on my watches where it works. Turns out it's just the same flat light green paint used on the dial area of the Racer version. 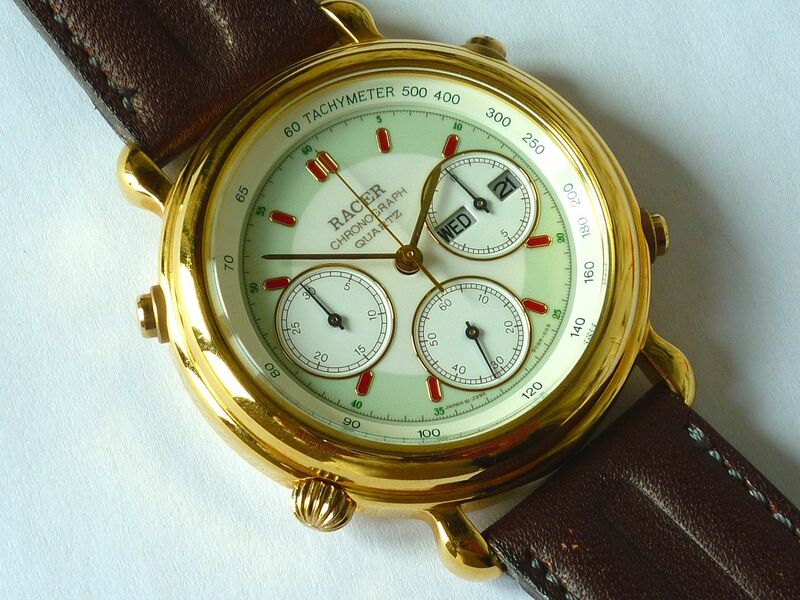 The batons on the Racer dial appear to be filled with red enamel. I say 'appear', because I haven't popped the dial movement out to confirm it. What I do know is that when they catch the light, they glisten like little jewels. Trouble is it's damned difficult to photograph. No chance, Lawrence - this one's a keeper, even though it may not technically be NOS any more, now that it's been on my wrist ! Of course hopes of collecting a full set of originals go out of the window almost immediately. Set collector ? Moi ? Seems I was wrong in what I wrote earler about this one, which at present is probably my favourite of these three NOS RACER J39's. This isn't any 'parts bin' special (or at least until an Orient branded J39024-50 surfaces, anyway). 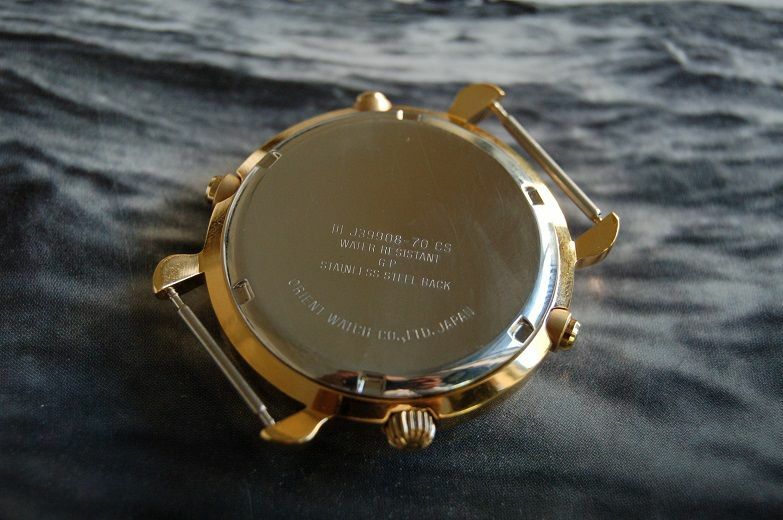 The gold-plated watch case isn't the same as used on Steve's Puma Y19904-50. Indeed, if I'd studied the photos of his watch properly, I'd have seen that it has longer lugs, whereas the Racer J39024-50 has very short lugs, with a straight edge between them. As the seller stated in his description it's 39mm diameter - a decent size, though somehow that dark enamelled bezel makes it look bigger. The strap lug width is again 19mm. This third photo better shows the sub-dials' colour (although their rims are chrome, rather than gold) and the Rado-esque enamalled bezel. The black-painted hour and minute hands are still clearly visible as they pass over the sub-dials, by virtue of their lume. Where this otherwise very attractive dial is a little disappointing are the hour marker 'batons'. They are as they appear - just black outlines. Once again, the strap is an Orient branded one (no surprise really). 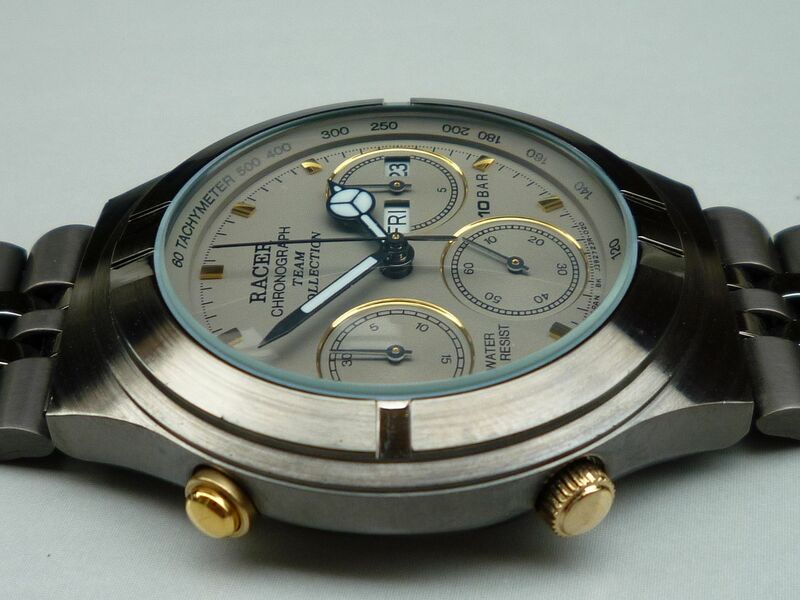 The case-back carries the typical Orient case back stampings, apart from one thing - the [DB] to the left of J39024-50. Of more anon. 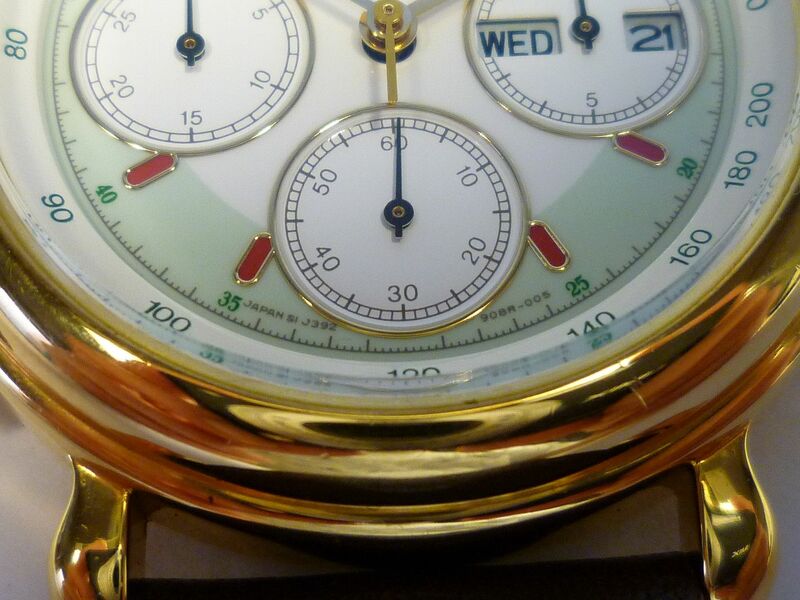 At the time of writing, I still haven't taken the dial / movement out to make a note of the remainder of the dial part numbering, hidden under the Tachymeter ring. However, it will have to come out, because although all the watch's functions are working as they should, the crown feels inordinately stiff to turn. Maybe it's just the tightness of the 'new' crown stem seal, or perhaps a lack of lubrication. I took this first wrist shot photo of it on Tuesday afternoon, per the day / date displayed, not long after I'd unpacked it. As I'd suspected, from the seller's first listing photo, there is an issue with the day change-over - but not quite what I'd expected and it may be repairable. I carefully aligned the day window manually for this photo (of more anon). Indeed, not only hadn't I cleaned it - note the grubbiness in the notches on the bezel, but I hadn't then even sized the bracelet to fit me. Look hard at the lower part and you can see some slop. I took a few photos of the watch on Wednesday, but it was getting late in the day and so most shots had to be artificially lit. I've since discarded the bulk of them and taken a fresh set. In fact, because the sky was dull and overcast today, I actually took them outdoors. For a 'normal 7A38' (i.e. 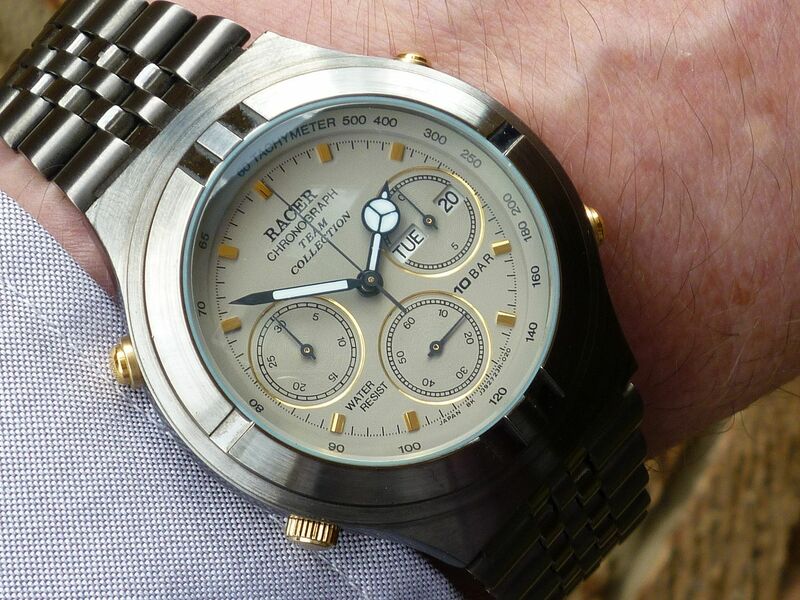 one without a rotating 'divers' bezel), this is a comparatively large watch. Not quite the 42mm the seller stated in his description, it measures 41.5mm diameter. 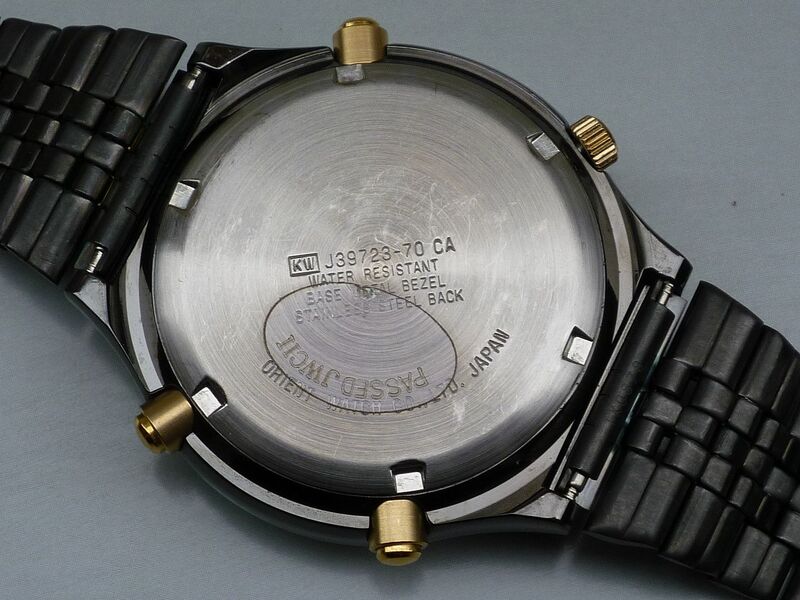 The watch case is most definitely different to that used on the Orient J39725-70 and the Puma Y19x01-70's, etc. 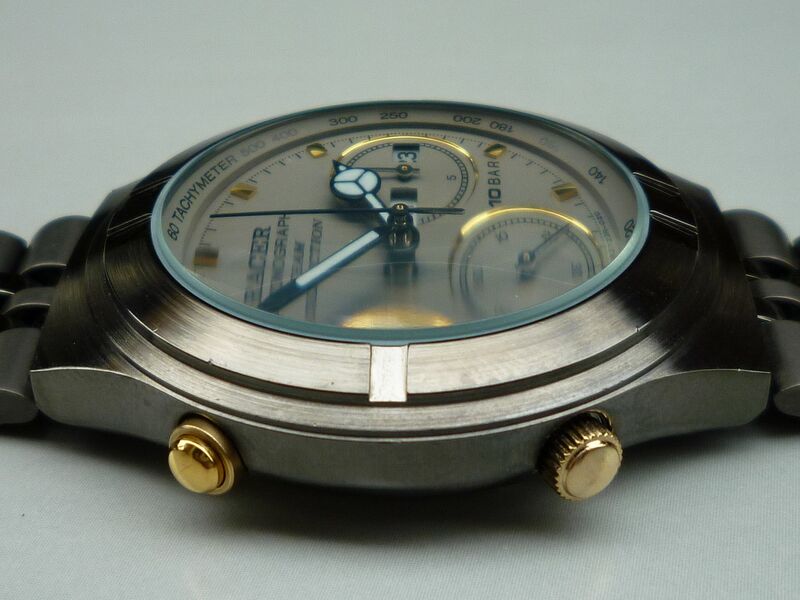 Those models' watch case measures a shade over 38.5mm diameter. Measured top to bottom over the ends of the lug boxes, the Racer J39723-70 is only half a millimeter longer, but the other significant difference is that its hooded lug boxes are only 19mm wide, not 20mm as I'd incorrectly assumed. That explains the rather more severe taper towards the corners. Something I hadn't noticed (before I cleaned them up) was that the two machined notches at the top and bottom of the bezel are a decorative design motif which continues on from the polished inner links of the bracelet. That photo best captures the coating colour. Unsurprisingly, it's similar to the 'gunmetal' finish of my very first Orient J39, the J39601-70 which I bought from German collector, Kurt. The mineral glass crystal fitted to the Racer J39723-70 is pronouncedly domed and can cause reflections and considerable distortion when viewed from the side. 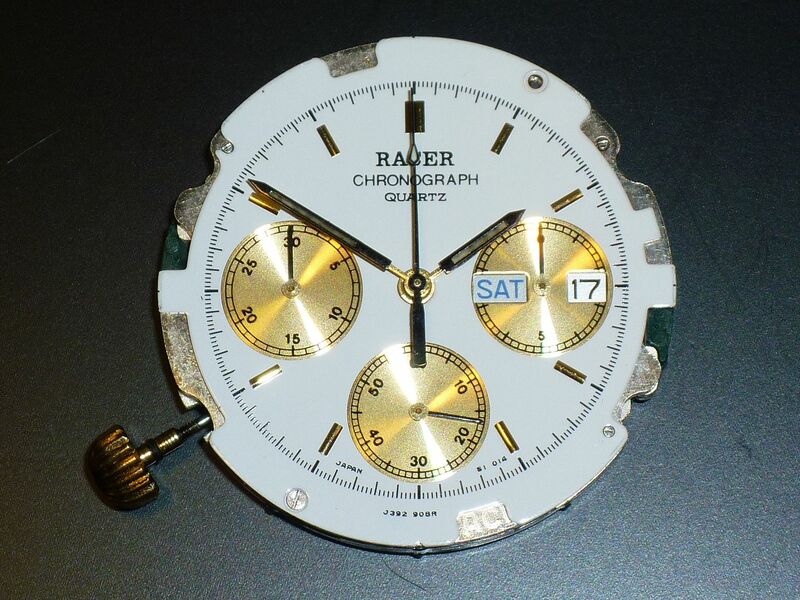 It also sits well proud of the bezel, leaving its edge vulnerable to accidental chipping; a poor design, IMHO. The case-back stampings are pretty much as I'd expected to find on such an Orient J39, apart from the [KW] before J39723-70. 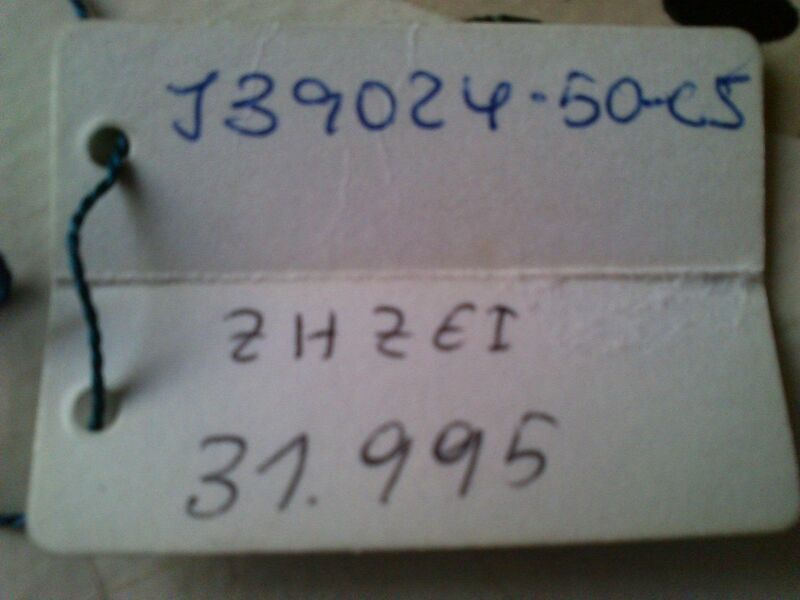 Remember the previously described Racer J39024-50 had [DB] stamped there ? 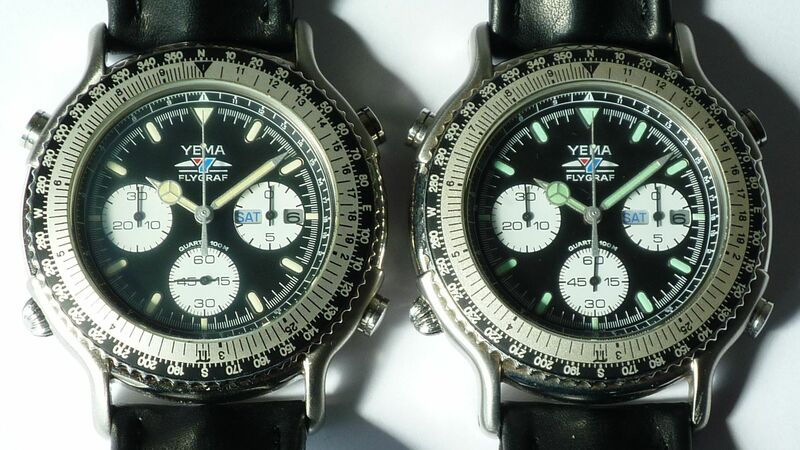 So, in the interests of furthering my anorak-level research into these watches, I've just checked the case-backs of all the Orient, Racer and Puma J39's and Y19's in my collection - including these recent additions, now 19 of them. 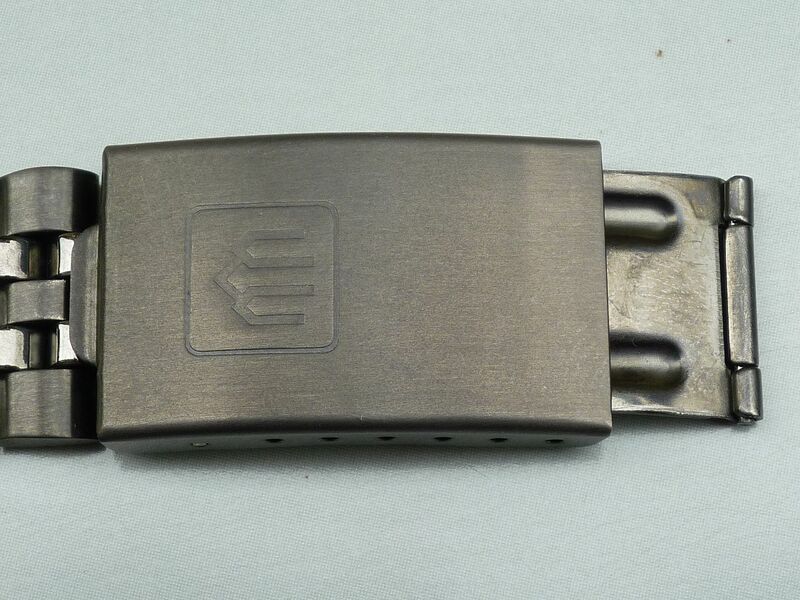 The majority - 12 (all sharing the same basic lozenge-shaped hooded 20mm lug watch case, both Orient and Puma) have a [Y] stamped before the model number (and a suffix CA). 5 more: all 4 of the Orient and Racer J39908-70's and my J39909-80 have [I] stamped before their model numbers (and a suffix CS). Why are these two different ? What is the significance of [DB] and [KW] ? That photo and one below show the unusual pusher treatment - where not only the buttons, but also their housings are gold plated. 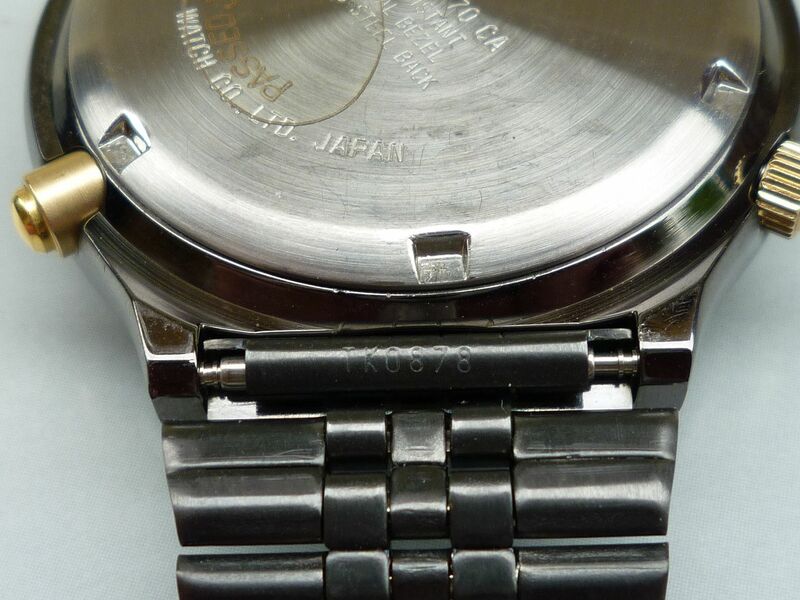 The 19mm folded link 'Jubilee' style bracelet is stamped on the spring bar tube in the usual Seiko oops, Sorry - Orient manner, but the part number TK0878 doesn't fall into any sequence of Seiko and Orient bracelet part numbers; or none that I've seen previously. The bracelet clasp logo had me scratching my head for a while, so I asked the question here on the WatchuSeek's Orient sub-forum. If you follow the link, you'll see that the two artificially-lit photos I first posted there weren't the best, but they were clear enough to get the answer I sought. 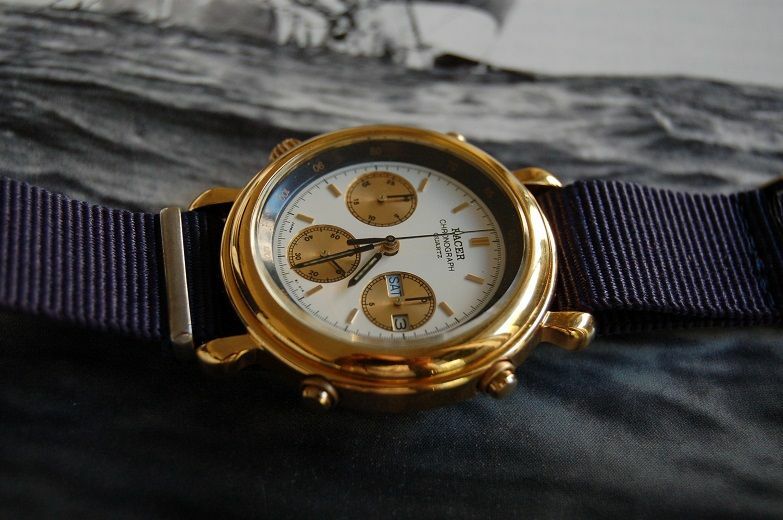 Thanks to Anzac1957 (Tony) for his reply - and more so to Skippington, who correctly identified the logo as one normally seen on the dials of 1970's and 1980's vintage Orient quartz watches (but without the surrounding square outline). 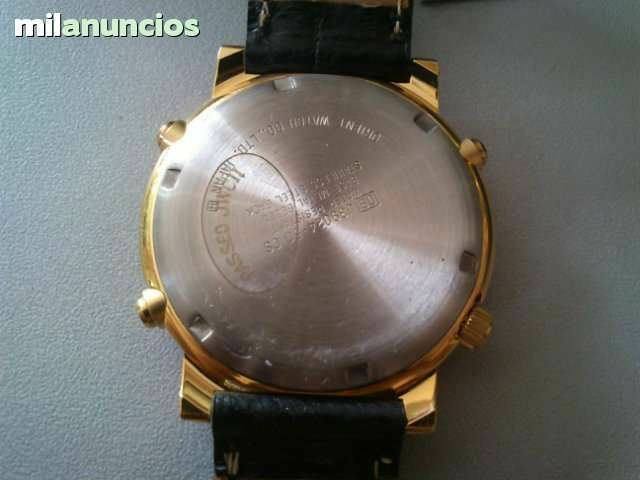 When Julio purchased the watches from seller Alfred, on my behalf, last week, we already knew there was an issue with the day / date change-over mechanism on the J39723-70. 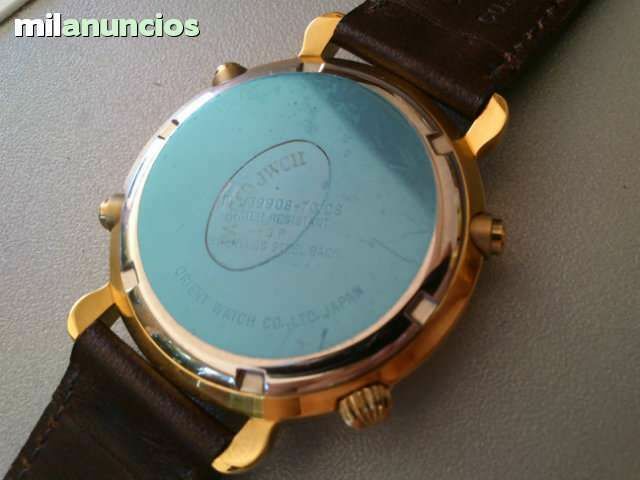 I had specifically asked Julio to tell the seller not to replace any flat batteries in the three watches, because I was concerned that their almost virgin case-backs might get scratched in the process. When he was handed them, Julio noticed that the J39723-70 was 'ticking' every two seconds - the inbuilt low battery indicator, so he negotiated a small discount. When the watch arrived, it was still running, so I gave it a quick function test and immediately noticed another, previously undisclosed problem - the sweep second hand was very reluctant to move, both when the chrono' was started, and trying the self test. It stuttered, and maybe moved one or two divisions. Nor could it be reset with the 4 o'clock pusher. So I unscrewed the case-back - to replace the battery and found this - the classic deflected centre seconds finger tension spring problem. It had likely been that way since the last battery change. As it also had a dimpled impression in the round end of the finger, made by the ham-fisted jeweller, I replaced it. 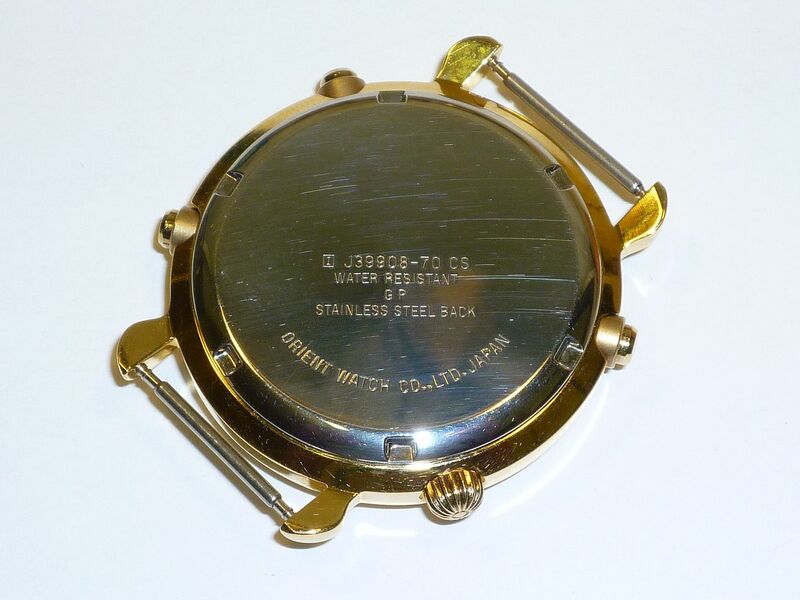 The movement back-plate is stamped Orient J3920, unlike the secondhand Seiko 7A38 movement in the Tickdong Racer J39908-70 ! I haven't checked the other two NOS Racer J39's yet, but I naturally expect they'll also have correct Orient branded movements fitted. One other thing that flash-lit photo also captured nicely was the '710' of the green plastic insulator spacer. 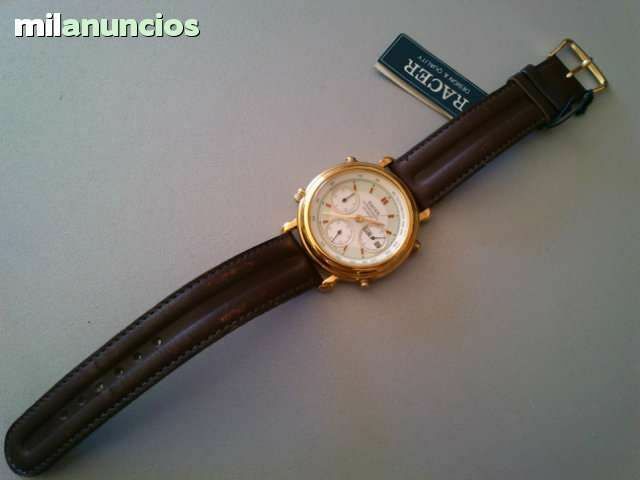 That's Seiko p/n 4408.710. I still haven't tackled the problem of the errant day / date change-over wheel on the J39723-70 yet, but the mechanism isn't completely broken as I'd initially suspected. Overnight, left to it's own devices, the date changes over automatically, perfectly. But the day wheel always comes to rest, showing the correct language, annoyingly only halfway into the window, as shown in the close-up photo below. Note also that the day wheel is English / Spanish (ES), as are all three of the NOS Racer J39's (but not the franken Tickdong Racer J39908-70). In all the previous photos I've posted of this watch, the day has been very carefully tweaked. If you pull out the crown to the first position, using the quickset, the day wheel feels like it's clicking over normally, but it's default parked position seems to be out by one gear tooth. It is possible to turn the crown very carefully to align the day with the aperture and then ease it back in very gently. Sometimes it will stay there. But if you push the crown in as one would normally do, the day jumps back to this halfway position. Despite their apparent mismatch, the Mercedes hands are growing on me. I've found a pair of bevelled gold-plated lumed hands (off a two-tone 7A38-7060, I think), which would probably look better. But even if I do find I have to pull the hands to sort out the day change-over problem, it's likely that I'll keep the Mercedes hands - in the interests of correctness and originality. The original purpose of that photo was not to show either the Mercedes hands or the mis-aligned day wheel, but the dial part number printing at the bottom. Without popping the dial / movement out, like the NOS Racer J39908-70, I believe it's all visible and nothing further is hidden under the Tachymeter spacer ring. The format is slightly different once again - showing typically un-Japanese inconsistency. There is something else different, of possible significance on this one, too. All my other Orient / Racer J39's and Puma Y19's have SI printed somewhere at the bottoms of their dials. SI stands for Seiko Instruments - a tacit admission of their involvement. This one doesn't have SI anywhere - instead BK is printed between JAPAN and the dial part numbers. 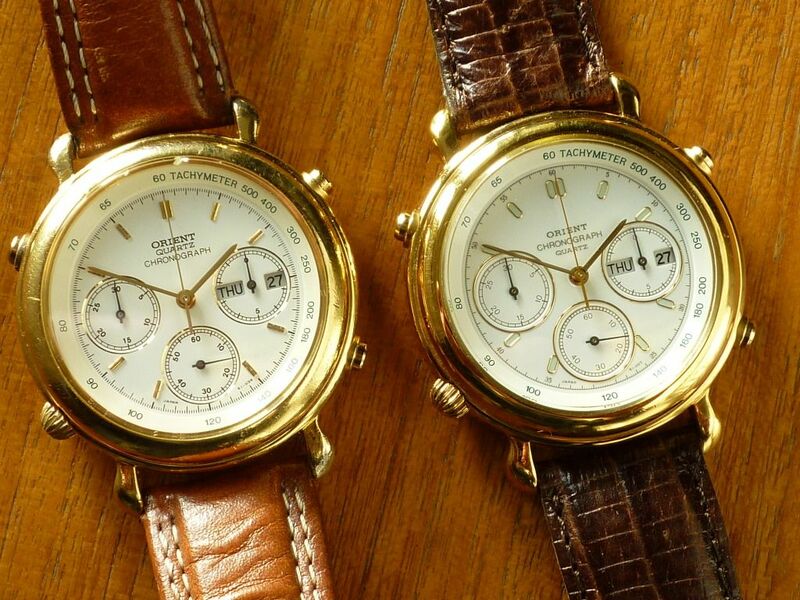 So another hereto unanswered question raised by these watches. 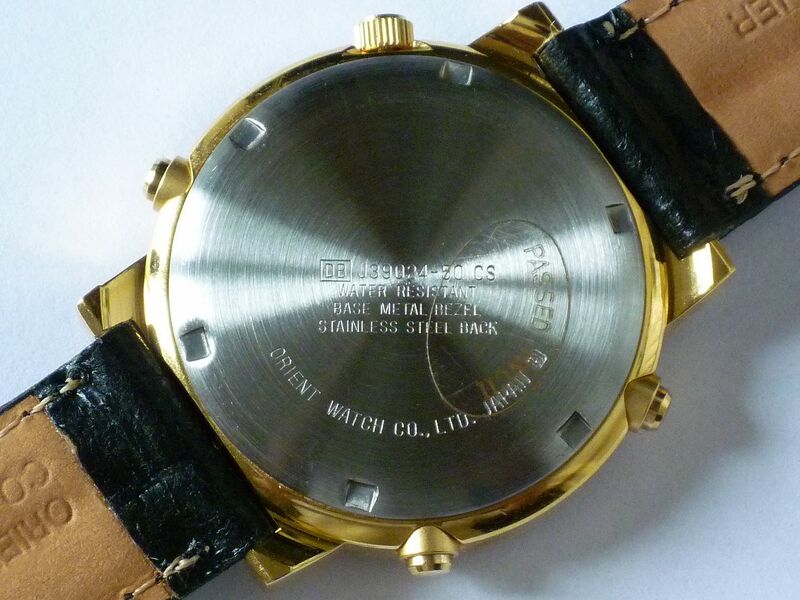 Yes, I suppose I could contact the Orient Watch Co. Ltd., and ask them the question. They did ostensibly manufacture the Racer J39's. 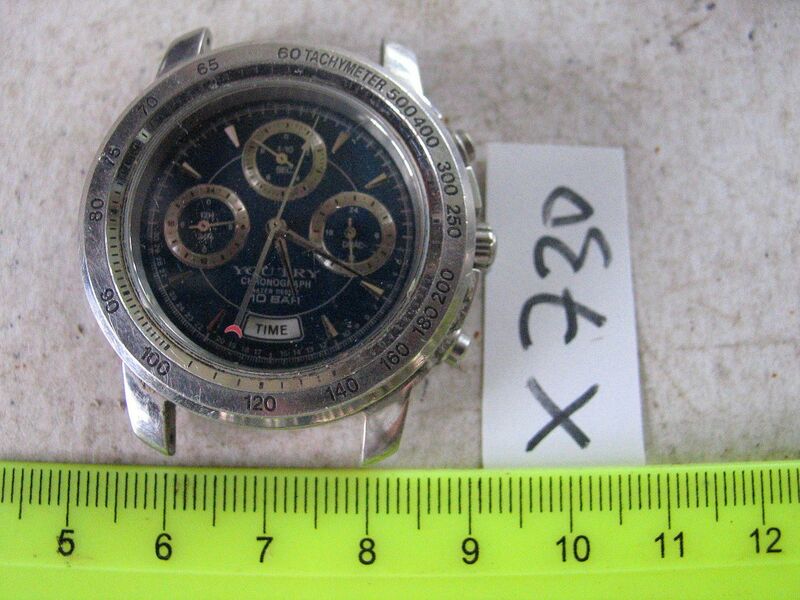 Then again, did Orient Watch Co. Ltd. actually manufacture any of these thinly disguised Seiko 7A38's themselves ? My apologies for the time it's taken me to eventually finish writing up this somewhat lengthy post (rather longer than I anticipated) and for having kept the thread locked while I was doing so. That was simply to save any distracting interruptions while I was composing. Thanks once again to Lawrence for finding these rare 7A38's and especially to Julio for having 'gone the extra mile' to buy them. * See next post over the page.